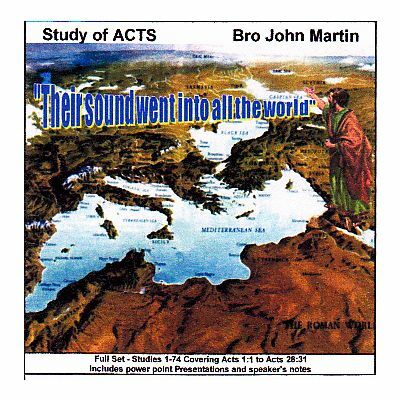 Studies on the book of Acts given by bro. John Martin at the Enfield Ecclesia Adelaide between 2004 and 2011. 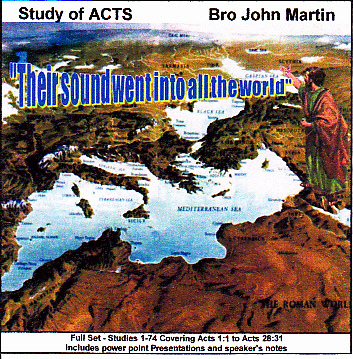 This DVD contains all 74 studies from Acts1:1 to Acts 28;31. 3. The visual presentations used for each study in MS Powerpoint format. 4. The speakers notes for each study in MS WORD format. Within each folder you will find 74 files - one for each study. The size of all the files on the DVD is 4.2Gb. The files will be easier to access if you download them from the DVD to the harddrive on your computer, but this is not essential.